Greek Prime Minister, George Papandreou, made a major overnight reshuffle of his cabinet in a move to improve the economy and the social policy sectors. The ministers of development, labor and health were replaced. The only key post that remained unchanged is the one of the finance minister. Government spokesman George Petalotis announced the news Tuesday morning and the new cabinet was sworn in at midday also on Tuesday. Papandreou's decision to retain George Papaconstantinou as finance minister is considered a strong signal that the socialist government will not be swayed from the tough economic measures. Several socialist party members, who served in previous socialist governments, have been brought back into the cabinet. Dimitris Droutsas, until now Deputy Foreign Minister, is the new Interior Minister, a post that was held by Papandreou himself, with Droutsas as his deputy. Civil Protection Minister, Mihalis Hrisohoidis, will now lead the Economy Ministry, while the PASOK Member of the Parliament, Hristos Papoutsis, was appointed in charge of Civil Protection. The Ministry of the Merchant Marine, a vital economy sector in Greece, was once again separated from the Economy Ministry as requested by ship owners, and will be led by Yannis Diamantidis. Former Economy Minister, Louka Katzeli, who often had differences with Papaconstantinou was moved to the Ministry of Labor and Welfare while Andreas Loverdos went from the latter to the Health Ministry. The new Minister for Investments, Harris Pampoukis, is known to be a close supporter and partner of Papandreou. The only Minister who has to leave is Katerina Batseli - she was dismissed from the post of Agriculture Minister and is replaced by Kostas Skandadis. Greek press writes the move is a punishment for her for refusing to stand in the upcoming local elections on November 7. The changes were made on the same day when the EU finance ministers are meeting to approve the next tranche of the bailout loan for Greece. Greece is imposing austerity measures including pay cuts and tax rises in return for a massive EU-IMF bailout aimed at rescuing the country from bankruptcy. 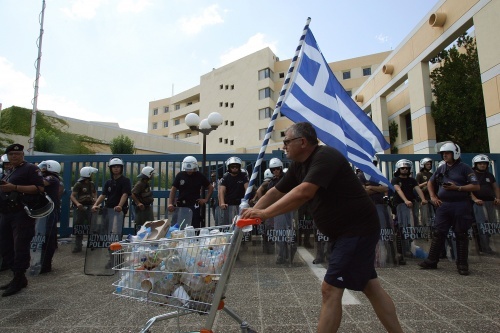 Greece been hit by waves of protests and strikes since its financial crisis began 11 months ago.